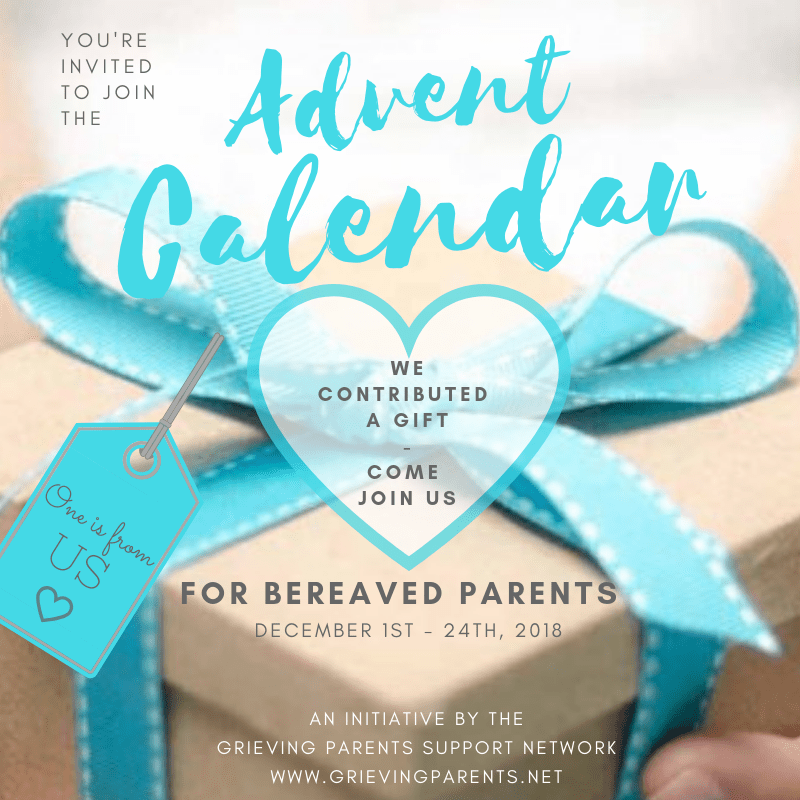 Supporting grieving parents this holiday season with a special giving advent calendar – will you join us? You are welcome to download any of the Advent Calendar images on this page and share them on social media, just right click on the image and Save Image to your personal device. Preview the Advent Calendar gifts! What is the traditional Advent Calendar? I (Nathalie) grew up with the advent calendar tradition where children or adults are given an advent calendar to celebrate the days leading up to Christmas. The traditional calendars typically have a little window that opens to reveal an image relating to the season. More recently, the industry caught on and produced calendars including candy or chocolate under each window. If given personally, the recipient has a gift to unwrap each day between December 1st and 24th. This tradition has been adopted by many persons in Europe and North America, whether they celebrate Christmas or are Christians. What is the Grieving Parents Advent Calendar? Though the Grieving Parents Support Network is not a religious platform, we celebrate the tradition of GIVING — especially the gift of love and support — during the holiday season, which we know all too well can be a difficult season for many of us. We hope these Advent Calendar gifts, many which are lovingly hand-made by our donors, will be a particularly loving support over the holidays. The monetary value of the gifts is of little – what matters is the support we put forth for grieving parents worldwide by coming together and sharing during the Advent season with this special event. 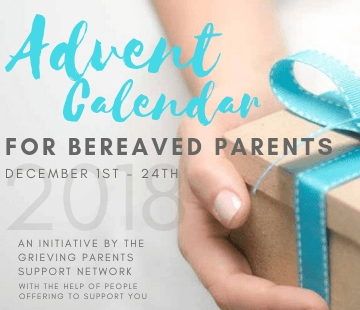 How Does the Grieving Parents Advent Calendar Work? We use Gleam to draw winners for several days at a time. Refer to the Advent Calendar tab on our Facebook page to see the various ways parents can earn entries for the random drawings. We will post regularly during December to announce daily gifts, drawings and winners. You can also see the full list of wonderful Advent Calendar gifts on our website. How Do I Join the Advent Calendar Event? 1. Join us as a GIFT DONOR with a gift for the grieving parents’ community — see full details below under Gift Donor. 2. Join as a PARTICIPANT by following the event and completing tasks to earn entries in the random drawings — see additional details below under Participants. Are you able to offer books, jewelry, memorial art, gift box, your services or any other item to be gifted as part of this event? In addition to listing your gift on our Advent Calendar Gifts webpage, we gratefully showcase your product/service and page/website on our social media platforms during one day in December. Your generous gift will be shared with the Grieving Parents Support Network community, providing you with extensive exposure among our followers (currently over 19,000+) and their networks. Share the Advent Calendar Facebook Event page. This will help spread awareness of the event and increase participation. Share the “we contributed” image on your website and social media platforms. Use the image above to proudly show you are a gift donor for this event! Share the page outlining all the gifts and containing all givers details. We will add your Facebook page to pages liked by the GPS Network; we would appreciate if you would do the same. Your gift may be any of the following: your services (for example grief support, reiki, etc), books, jewelry, art, gift cards to your shop or other products that serve to support grieving parents. There are no guidelines regarding the monetary value of your gift. We ask only that your gift is of value to the recipient as a real representation of love and support. You will need to deliver your gift to the randomly selected recipient. As our network is global and we do expect worldwide participants, this means you may need to ship internationally (we do ask that you cover this cost as part of your gift). You may also deliver your gift electronically via online download or by email. Each gift recipient will be randomly selected and tracked via Gleam. Nathalie Himmelrich will then send you the name of the selected recipient and direct them to contact with their address for delivery of their gift. You then send or ship the gift directly to the recipient. All gifts are given freely without any expectation of additional purchases or continued business from the recipient or the Grieving Parents Support Network and our followers. I’m Ready to Sign Up as a Gift Donor! We are so excited that you will join with us as a gift donor for this meaningful event! Please complete our Advent Calendar Gift Donor Google Form so we receive your complete details and learn more about your gift. Only 24 spots are available and will be filled on a first come first served basis. The entry deadline is November 25th and spots are filling up quickly, so don’t delay! To take part in this giveaway, simply follow the Grieving Parents Support Network page on FB and join the event here. There are multiple ways to earn an entry each day, be sure to complete as many entries as possible to increase your chances in the daily drawing! In the spirit of giving and sharing please share with your friends so they too may participate! Thank you for joining us for this event, either as a gift donor or as a participant! ❥ Preview the list of lovely Advent Calendar Gifts lovingly donated for this giveaway! 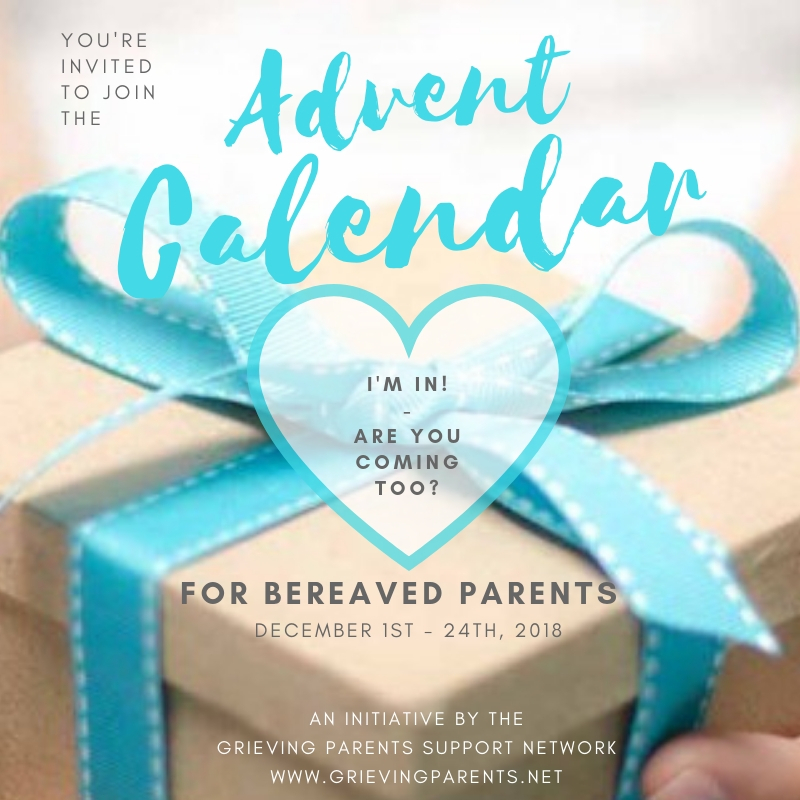 ❥ Please share the Grieving Parents Advent Calendar event on your page, with friends who are on this journey with you and in any groups that allow sharing this kind of event.